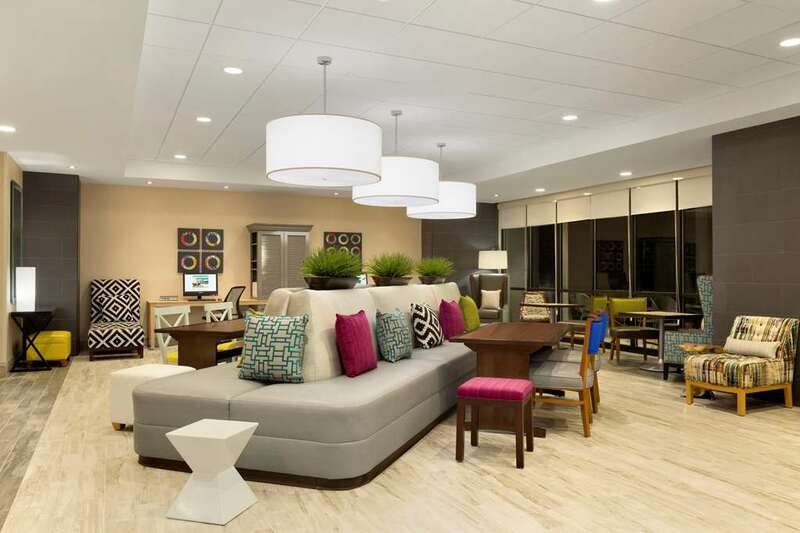 Settle in to our new Home2 Suites by Hilton Hasbrouck Heights hotel and enjoy all the comforts of home minutes from New York City near the Secaucus area 17 miles from Newark Airport and just two miles from Teterboro Airport. Whether you*re travelling for business or leisure our Hasbrouck Heights NJ hotel is designed for an unforgettable stay. Make yourself at home in one of our spacious suites with separate living dining and sleeping area as well as a fully equipped kitchen complete with full-size refrigerator dishes flatware dishwasher microwave and induction burner upon request at the Front Desk. Utilize the flexible space and moveable furniture to create a customized home or office environment. Bring the family and explore the Big Apple from our Hasbrouck Heights hotel. Our two-bedroom suites sofa sleepers and connecting rooms offer an ideal family retreat. Upgrade your stay to a higher floor and enjoy beautiful views of Manhattan. Gather each morning around the Inspired Table for free breakfast featuring a variety of delicious hot breakfast sandwiches fresh fruit coffee and juices. After a busy day unwind with a swim in the indoor saline pool or cozy up by the fire pit on our outdoor patio. Make the most of your time at our Spin2 Cycle Center a combination laundry and fitness facility and stock up on snacks beverages and microwavable meals at our 24-hour Home2 MKT. Cooked-at-the-table specialties - full sushi bar in a spacious opulent setting with Asian motif. Local trattoria chain serving traditional red-sauce Italian fare in a contemporary setting. Relaxed time-tested restaurant with a small patio serving classic Greek cuisine - wine. Upscale Italian eatery serves seafood dishes - more against a grand romantic backdrop. Formal Spanish eatery with a bar - big portions is popular with Meadowlands-bound diners. - U.S. Customs - Border Prot.